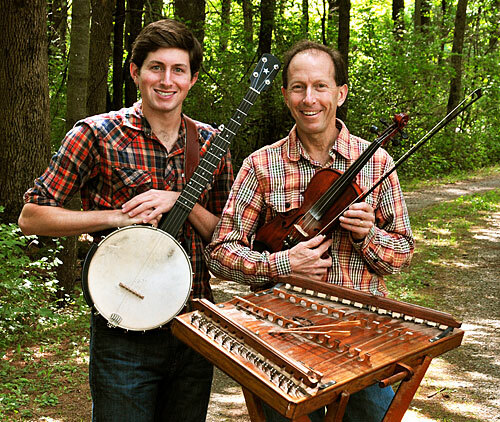 Baltimore-based father-son duo Ken and Brad Kolodner bring their virtuosity on the clawhammer banjo, fiddle and hammered dulcimer to Lawrence University Monday, Feb. 27 as part of the university’s World Music Series. The Kolodners will be joined by fiddler extraordinaire Rachel Eddy. A 1976 Lawrence graduate, Ken Kolodner never played an instrument before taking up the fiddle at the age of 23. After Lawrence, he earned a Ph.D. at Johns Hopkins University and began a career in public health as an epidemiologist. He evolved from full-time scientist to full-time musician, establishing himself as one of the country’s most influential old-time fiddlers and hammered dulcimer players. He began touring in 2009 with his son, Brad, a radio personality in Washington, D.C., where he hosts a progressive bluegrass, old-time and Americana show. Brad Kolodner is a rising star in the clawhammer banjo world. Together they play new arrangements of original and traditional old-time music on instruments that include the gourd banjo, banjola, triple fiddles, hammered mbira, hammered dulcimer and others.